I normally don't make resolutions, but I would like to set a few stitching goals for myself. There are a few things I would really like to finish this year. I only have 3 1/2 blocks to go! I think I'm going to focus on it until it's finished! I'm fairly close to being finished - I just need to do it already! I'll make it my focus after Shores is finished. Love this project - I don't want it to become a UFO! 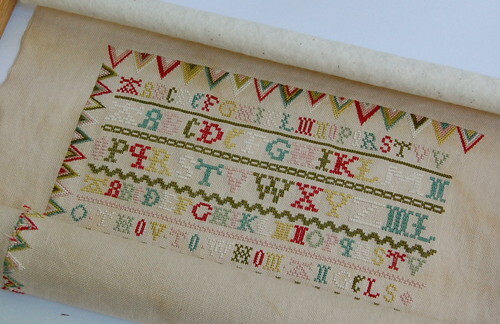 This sampler is just too gorgeous not to get finished!! 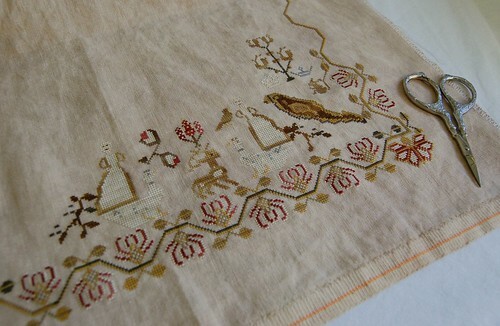 Another gorgeous repro sampler. Definitely want to get back to Ruthie sometime this year. This is such a fun design and the blocks go so quickly, there is really no reason not to get it finished this year. I must also add my two new starts... Frances Eden and Elizabeth Mears. I really hope to get them all finished this year. Not sure if I can actually do it, but I'm going to try!! Lovely WIPs, and some so close to being completed. Maybe 2011 will be the year!! Great eye candy! Love all of your pieces!! I am thinking I may have to add Sarah Woodham to my wishlist! You have some gorgeous WIPs Nicole! Good luck with your goals! All your WIP's are gorgeous. Good luck to you in achieving your goals. I am looking a view months your weblog, and I loves your work. I hope you can finish this year your work, in the Netherlands we say "Zet hem op, je kunt het!" Wonderful projects all of them! You can definitely get them done, you are such a prolific stitcher, Nicole! I just love all of your WIPs. Seeing your Shores makes me want to pick up mine again - maybe! LOL You have really picked some wonderful ones to work on this year. We'll be cheering you all the way! I think you can do it. They're all wonderful WIPs. We'll root you on! Every single one of them looks so gorgeous and even they hurt my eyes!! lol Happy New Year! Nicole, I have to confess you seem to finish something every week, so I would never have guessed you had so many WIPs! I do love Ruthie and hope to see that get some face time on the blog! Good luck. Beautiful WIPs. You will have Shores done in no time and then you can move on to your other pieces. Love all of them!! Gorgeous WIPs. Good luck with your goals I am sure you will finish them. They are all stitched so beautifully. Best of luck on your 2011 goal. Happy New Year to you. Those are all lovely - I'm sure you can make it! Ha ha! Join the BAP/WIP club!! You are so close on a couple of those-wish I could say the same about my BAPs! They are all beautiful wips! Excellent selections Nicole. I love every one of them. I'll be cheering you on!! Fabulous projects! I'm getting ready to put first stitches in Paradise Lost as soon as I get off the computer. Great plans and a lot of them are on my list too :-). I definitely think you can finish them all. Love all your WIPs Go, go, go! I think, I mean KNOW, you can finish these boys off in 2011~~ You are one of the most accomplished stitchers out there, so go for it.....I see you meeting and exceeding your goals!! Even finishing one of your goals for 2011 would be a wonderful accomplishment, but I'm sure you will finish them all - they all look gorgeous, BTW. Happy New Year to you and your boys, Nicole! Nicole, you have your work cut out for you !!! 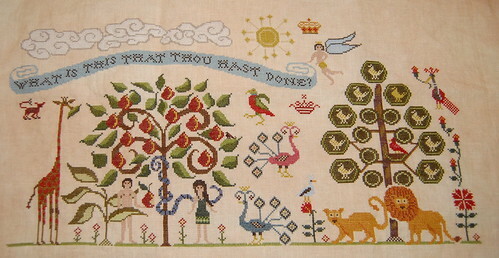 I love all your projects and I know you are a quick stitcher, so I predict you will finish them all. Wonderful WIPs and fabulous goals! Looking forward to seeing these exciting finishes in 2011! whooo, you've already been busy, so I'm sure you won't have any trouble finishing these pieces in 2011! Hi there.. I've stumbled across your blog while bloghopping.. Love you WIPs... such beautiful designs! Nicole, great set of goals! I love all of these!! I have a question, the alphabet blocks from carriage house designs...are they all in one chart, or did you have to buy them as individuals? I think they are so cute... 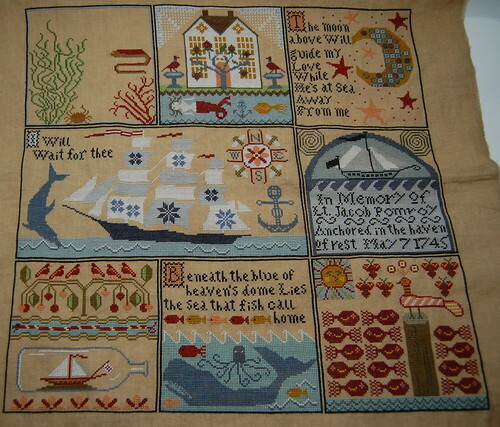 I also especially like the Sarah Woodham sampler..it's so beautiful. good luck! I'm sure you'll get there. They have them as one chart now (http://www.wyndhamneedleworks.com/Carriage_House_Samplings/alphabet_blocks_the_whole_kit_.htm), but I had the individual charts before they put them together. Wow, you have some gorgeous wips, can't wait to see your progress and hopefully finishes this year. These are gorgeous! You can do it! Love your shores progress! Every time I see this project I am tempted to start it!